I may not have curly or wavy hair but my straight hair tends to be pretty drying from using hot hair tools and the like. I'm really excited to see how this product will work on my hair and notice if it's smoother and less drying. With hair products that are recommended for a specific hair type, results are likely to vary. In my case, I can only comment on the nourishing aspects, the manageability, and my overall thoughts of using this product for my hair type. The shampoo did an amazing job at cleaning my hair, just apply product to wet hair, massage, lather and rinse. It moisturized and lathered nicely into the hair without foaming too much. In terms of texture of the shampoo, it was not too thick, not too watery. It has a really nice rich fragrance of argan oil. My hair felt moisturizing and silky even before applying conditioner. After shampooing, massage conditioner through the hair, avoiding roots and rinse thoroughly. The conditioner went on nicely, it did not weigh down or leave any leftover residue in my hair. Similar to the shampoo, the conditioner has a lighter fragrance of argan oil. The texture of the conditioner was more towards a lotion consistency. Perfect for use on both damp and dry hair. Dispense 1 pump, rub palms together and apply evenly on hair, avoiding roots. The Crème Serum instantly smoothes hair while giving it long lasting manageability. My hair looks and feels nourished. Just one pump is all that was needed and my hair was left with a soft finish and did not weigh down my hair nor left it looking and feeling greasy. Overall, the Dove Quench Absolute seemed to work wonderfully on my straight hair even though the product is meant for someone who has curly or wavy hair. I think for someone who has curly/wavy hair, results will be noticeable, whereas my results are pretty minimal. I absolutely loved the dreamy scent of argan oil from all three products. In the end, my hair looked and felt manageable, less drying and soft (I was able to run my fingers down my hair without any trouble!). 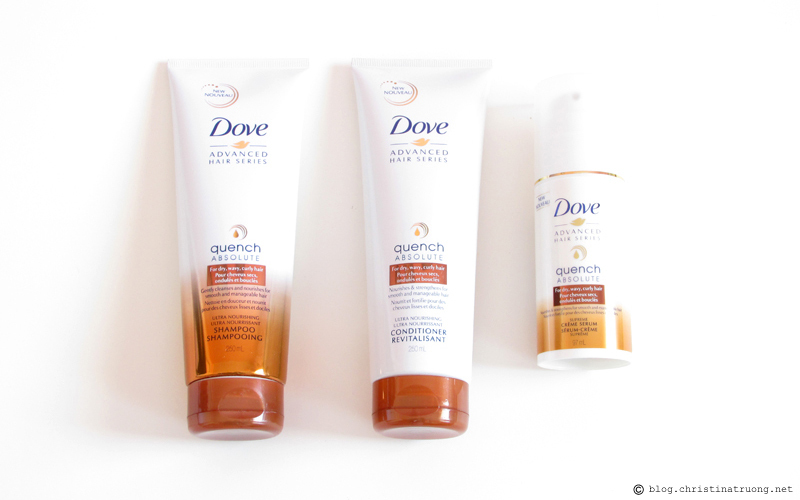 What are your thoughts on Dove Quench Absolute? Whether you have straight or curly/wavy hair, would you give it a try? Have you tried any other Dove hair care products before? I love the Dove dry shampoo (as much as you can like a dry shampoo), but I've never tried any other hair care from the brand. I already have super greasy hair, so I'm going to have to shop around and find some other products from the range. Oh, I've never tried their dry shampoo before. I'll definitely look into that! Greasy hair is the worst, I heard the less you wash the less grease, but that's hard to do. When I'm not using salon brands, Dove shampoos are my go to, and I have yet to try this line out, so I'll definitely need to ASAP! What other Dove shampoos have you tried? I've only tried this and (from many moons ago) the go fresh shampoo/conditioner and I love it! Oh no! Luckily it was just a sample but that's still awful :( What was the other Dove product you used? This is a great review. As someone with wavy hiar I'll definitely be on the lookout for these! This seems like it could be a good fit for my wavy hair! I love Dove products! I'll have to give this line a try! I like that this works on straight hair and not just curly hair - I have straight hair too so I would normally just skip right over this! Ahhh! I have straight hair too so it's good to hear that this product will work on my stick thin straight hair ;-) I'm a huge fan of Dove hair care products!